The Army Medical Materiel Agency collaborates with industry partners to build a medical technology designed to automatically document patient data and track medication during the branch’s medical evacuation missions. 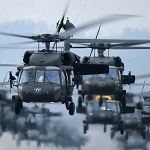 The Medical Ultra Wideband Broadcast system uses a wide-frequency, bluetooth technology to help military clinicians access patient information, inventory and arrival times via a tablet, the U.S. Army said Thursday. MEDHUB is built to transmit data to hospitals up to 30 minutes before a patient arrives at the facility. 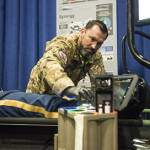 “It flows off of the platform wirelessly to a medical treatment facility — where we’re taking the patient to, therefore they can prepare for the arrival of one or more patients,” said Lt. Col. Christian Cook, MEDEVAC mission equipment product manager. The system is also equipped with built-in sensors, heart rate and vital sign monitoring tools and blood pressure cups. The Army aims to field the system by 2020.